Michael the Brave (Romanian: Mihai Viteazu(l) pronounced [miˈhaj viˈte̯azu(l)] or Mihai Bravu pronounced [miˈhaj ˈbravu], Hungarian: Vitéz Mihály; 1558 – 9 August 1601) was the Prince of Wallachia (as Michael II, 1593–1601), Prince of Moldavia (1600) and de facto ruler of Transylvania (1599–1600). He is considered one of Romania's greatest national heroes, and he is seen by Romanian historiography as the first author of Romanian unity. His rule over Wallachia began in the autumn of 1593. 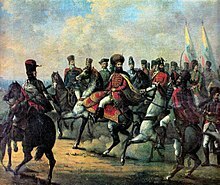 Two years later, war with the Ottomans began, a conflict in which the Prince fought the Battle of Călugăreni, considered one of the most important battles of his reign. Although the Wallachians emerged victorious from the battle, Michael was forced to retreat with his troops and wait for aid from his allies, Prince Sigismund Báthory of Transylvania and Holy Roman Emperor Rudolf II. The war continued until a peace finally emerged in January 1597, but this lasted for only a year and a half. Peace was again reached in late 1599, when Michael was unable to continue the war due to lack of support from his allies. In 1599, Michael won the Battle of Șelimbăr and soon entered Alba Iulia, becoming the imperial governor (i.e. de facto ruler) of Transylvania. A few months later, Michael's troops invaded Moldavia and reached its capital, Iaşi. The Moldavian leader Ieremia Movilă fled to Poland and Michael was declared Prince of Moldavia. Michael kept the control of all three provinces for less than a year before the nobles of Transylvania and certain boyars in Moldavia and Wallachia rose against him in a series of revolts. Thereafter, Michael allied with the Imperial General Giorgio Basta and defeated an uprising of the Hungarian nobility at Gurăslău in Transylvania. Immediately after this victory, Rudolf ordered the assassination of Michael, an action carried out on 9 August 1601 by Basta's men. Michael was born under the family name of Pătraşcu. In 1601, during a stay in Prague, he was portrayed by the painter Aegidius Sadeler, who mentioned on the portrait the words aetatis XLIII ("in the 43rd year of life"), which indicates 1558 as the year of Michael's birth. Very little is known about his childhood and early years as an adult. He is argued by most historians to have been the illegitimate son of Wallachian Prince Pătraşcu cel Bun, (Pătrașcu the Good) of the Drăculeşti branch of the House of Basarab, while others believe he merely invented his descent in order to justify his rule. 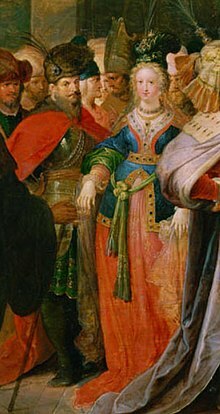 His mother was Theodora Kantakouzene, a member of the Kantakouzenoi, a noble family present in Wallachia and Moldavia, and allegedly descended from the Byzantine Emperor John VI Kantakouzenos. Michael's political rise was quite spectacular, as he became the Ban of Mehedinţi in 1588, stolnic at the court of Mihnea Turcitul by the end of 1588, and Ban of Craiova in 1593 – during the rule of Alexandru cel Rău. The latter had him swear before 12 boyars that he was not of princely descent. Still, in May 1593 conflict did break out between Alexandru and Michael, who was forced to flee to Transylvania. He was accompanied by his half-brother Radu Florescu, Radu Buzescu and several other supporters. After spending two weeks at the court of Sigismund Báthory, he left for Constantinople, where with help from his cousin Andronikos Kantakouzenos (the eldest son of Michael "Şeytanoğlu" Kantakouzenos) and Patriarch Jeremiah II he negotiated Ottoman support for his accession to the Wallachian throne. He was supported by the English ambassador in the Ottoman capital, Edward Barton, and aided by a loan of 200,000 florins. Michael was invested Prince by Sultan Murad III in September 1593 and started his effective rule on 11 October. He was considered a traitor as he had been forced to purchase the title of Domnitor (ruler). Not long after Michael became Prince of Wallachia, he turned against the Ottoman Empire. The next year he joined the Christian alliance of European powers formed by Pope Clement VIII against the Turks, and signed treaties with his neighbours: Sigismund Báthory of Transylvania, Aron Tiranul of Moldavia and the Holy Roman Emperor, Rudolf II (see Holy League of Pope Clement VIII). He started a campaign against the Turks in the autumn of 1594, conquering several citadels near the Danube, including Giurgiu, Brăila, Hârşova, and Silistra, while his Moldavian allies defeated the Turks in Iaşi and other parts of Moldavia. Mihai continued his attacks deep within the Ottoman Empire, taking the forts of Nicopolis, Ribnic, and Chilia and even reaching as far as Adrianople. In 1595, Sigismund Báthory staged an elaborate plot and had Aaron the Tyrant, voivode of Moldavia, removed from power. István Jósika (Báthory's chancellor and an ethnic Romanian) masterminded the operation. Ștefan Răzvan arrested Aron on charges of treason on the night of 24 April (5 May) and sent him to the Transylvanian capital at Alba Iulia (Gyulafehérvár) with his family and treasure. Aron would die poisoned by the end of May in the castle of Vinc. Sigismund was forced to justify his actions before the European powers, since Aron had played an active role in the anti-Ottoman coalition. Later on, in the same city of Alba Iulia, Wallachian boyars signed a treaty with Sigismund on Michael's behalf. From the point of view of Wallachian internal politics, the Treaty of Alba Iulia officialized what could be called a boyar regime, reinforcing the already important political power of the noble elite. According to the treaty, a council of 12 great boyars was to take part alongside the voivode in the executive rule of the country. 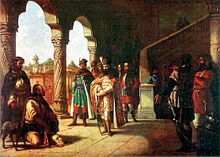 Boyars could no longer be executed without the knowledge and approval of the Transylvanian Prince and, if convicted for treason, their fortunes could no longer be confiscated. Apparently Michael was displeased with the final form of the treaty negotiated by his envoys, but was forced to comply. Prince Michael said in a conversation with the Polish envoy Lubieniecki: … they did not proceed as stated in their instructions but as their own good required and obtained privileges for themselves. He would try to avoid the obligations imposed on him for the rest of his reign. During his reign, Michael relied heavily on the loyalty and support of a group of Oltenian lords, the most important of whom were Buzescu Brothers (Romanian: Fraţii Buzeşti) and his own relatives on his mother's side, the Cantacuzinos. He consequently protected their interests throughout his reign; for example, he passed a law binding serfs to lands owned by aristocrats. From the standpoint of religious jurisdiction, the Treaty of Alba Iulia had another important consequence: it placed all the Eastern Orthodox bishops in Transylvania under the jurisdiction of the Metropolitan Seat of Târgovişte. During this period, the Ottoman army, based in Ruse, was preparing to cross the Danube and undertake a major attack. 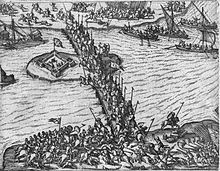 Michael was quickly forced to retreat and the Ottoman forces started to cross the Danube on 4 August 1595. As his army was outnumbered, Michael avoided carrying the battle in open field, and decided to give battle on a marshy field located near the village of Călugăreni on the Neajlov river. The Battle of Călugăreni started on 13 August and Michael defeated the Ottoman army led by Sinan Pasha. Despite the victory, he retreated to his winter camp in Stoieneşti because he had too few troops to mount a full-scale war against the remaining Ottoman forces. He subsequently joined forces with Sigismund Báthory's 40,000-man army (led by István Bocskay) and counterattacked the Ottomans, freeing the towns of Târgovişte (8 October), Bucharest (12 October) and Brăila, temporarily removing Wallachia from Ottoman suzerainty. 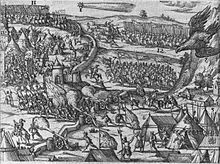 The fight against the Ottomans continued in 1596 when Michael made several incursions south of the Danube at Vidin, Pleven, Nicopolis, and Babadag, where he was assisted by the local Bulgarians during the First Tarnovo Uprising. 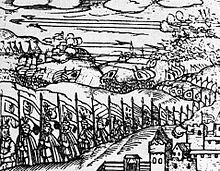 During late 1596, Michael was faced with an unexpected attack from the Tatars, who had destroyed the towns of Bucharest and Buzău. By the time Michael gathered his army to counterattack, the Tatars had speedily retreated and so no battle was fought. Michael was determined to continue the war against the Ottomans, but he was prevented because he lacked support from Sigismund Báthory and Rudolf II. 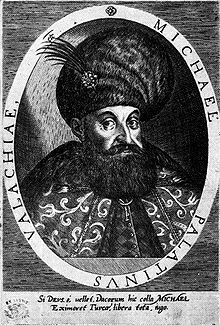 On 7 January 1597 Hasan Pasha declared the independence of Wallachia under Michael's rule, but Michael knew that this was only an attempt to divert him from preparing for another future attack. Michael again requested Rudolf II's support and Rudolf finally agreed to send financial assistance to the Wallachian ruler. On 9 June 1598 a formal treaty was reached between Michael and Rudolf II. According to the treaty, the Austrian ruler would give Wallachia sufficient money to maintain a 5,000-man army, as well as armaments and supplies. 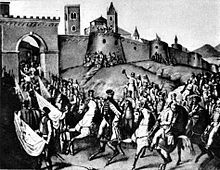 Shortly after the treaty was signed, the war with the Ottomans resumed and Michael besieged Nicopolis on 10 September 1598 and took control of Vidin. The war with the Ottomans continued until 26 June 1599, when Michael, lacking the resources and support to continue prosecuting the war, signed a peace treaty. In April 1598, Sigismund resigned as Prince of Transylvania in favor of the Holy Roman Emperor, Rudolf II (who was also the King of Hungary); reversed his decision in October 1598; and then resigned again in favor of Cardinal Andrew Báthory, his cousin. Báthory had strong ties to the Polish chancellor and hetman Jan Zamoyski and placed Transylvania under the influence of the King of Poland, Sigismund III Vasa. He was also a trusted ally of the new Moldavian Prince Ieremia Movilă, one of Michael's greatest enemies. 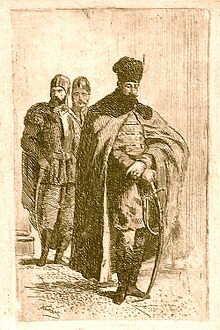 Movilă had deposed Ştefan Rǎzvan with the help of Polish hetman Jan Zamoyski in August 1595. I rose with my country, my children, taking my wife and everything I had and with my army [marched into Transylvania] so that the foe should not crush me here. He left Târgovişte on 2 October, and 9 by October he had reached Prejmer in southern Transylvania, where he met envoys from the city of Braşov. Sparing the city, he moved on to Cârţa where he joined forces with the Székelys. On 18 October Michael won a decisive victory against the army of prince-cardinal Andrew Báthory at the Battle of Şelimbăr, giving him control of Transylvania. As he retreated from the battle, Andrew Báthory was killed by anti-Báthory Székely on 3 November near Sândominic and Michael gave him a princely burial in the Roman Catholic Cathedral of Alba Iulia. With his enemy dead, Michael entered the Transylvanian capital at Alba Iulia and received the keys to the fortress from Bishop Demeter Naprágyi, later depicted as a seminal event in Romanian historiography. Historian István Szamosközy, keeper of the Archives at the time, recorded the event in great detail. He also wrote that two days before the Diet met on 10 October, Transylvanian nobles elected Michael the voivode as Prince of Transylvania. As the Diet was assembled, Michael demanded that the estates swear loyalty to Emperor Rudolf, then to himself and thirdly to his son. Even if he was recognized by the Transylvanian diet as only imperial governor subject to the Holy Roman Emperor, he was nonetheless ruler of Transylvania. When Michael entered Transylvania, he did not immediately free or grant rights to the Romanian inhabitants, who were primarily peasants but, nevertheless, constituted a significant proportion of the population. Michael demonstrated his support by upholding the Union of the Three Nations, which recognized only the traditional rights and privileges of the Hungarians, Székelys and Saxons, but he didn't recognize the rights of the Romanians. There is no evidence that Michael wanted Transylvania's Romanians to play a political role. 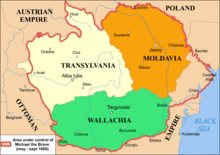 Indeed, while he brought some of his Wallachian aides to Transylvania, he also invited some Székelys and other Transylvanian Hungarians to assist in the administration of Wallachia, where he wished to transplant Transylvania's far more advanced feudal system. Michael began negotiating with the Emperor over his official position in Transylvania. The latter wanted the principality under direct Imperial rule with Michael acting as governor. The Wallachian voivode, on the other hand, wanted the title of Prince of Transylvania for himself and equally claimed the Partium region. Michael was, nevertheless, willing to acknowledge Habsburg overlordship. The Moldavian Prince Ieremia Movilă had been an old enemy of Michael, having incited Andrew Báthory to send Michael the ultimatum demanding his abdication. His brother, Simion Movilă, claimed the Wallachian throne for himself and had used the title of Voivode since 1595. Aware of the threat the Movilăs represented, Michael had created the Banate of Buzău and Brăila in July 1598 and the new ban was charged of keeping an alert eye on Moldavian, Tatar and Cossack moves, although Michael had been planning a Moldavian campaign for several years. On 28 February 1600 Michael met with Polish envoys in Braşov. He was willing to recognise the Polish King as his sovereign in exchange for the crown of Moldavia and the recognition of his male heirs' hereditary right over the three principalities, Transylvania, Moldavia and Wallachia. 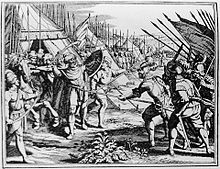 This did not significantly delay his attack however; on 14 April 1600 Michael's troops entered Moldavia on multiple routes, the Prince himself leading the main thrust to Trotuş and Roman. He reached the capital of Iaşi on 6 May. The garrison surrendered the citadel the next day and Michael's forces caught up with the fleeing Ieremia Movilă, who was saved from being captured only by the sacrifice of his rear-guard. 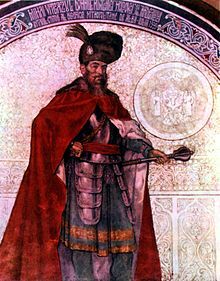 Movilă took refuge in the castle of Khotyn together with his family, a handful of faithful boyars and the former Transylvanian Prince, Sigismund Báthory. The Moldavian soldiers in the castle deserted, leaving a small Polish contingent as sole defenders. Under the cover of dark, sometime before 11 June, Movilă managed to sneak out of the walls and across the Dniester to hetman Stanisław Żółkiewski's camp. Neighboring states were alarmed by this upsetting of the balance of power, especially the Hungarian nobility in Transylvania, who rose against Michael in rebellion. With the help of Basta, they defeated Michael at the Battle of Mirăslău, forcing the prince to leave Transylvania together with his remaining loyal troops. 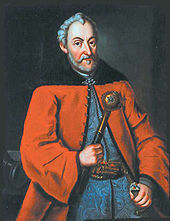 A Polish army led by Jan Zamoyski drove the Wallachians from Moldavia and defeated Michael at Năieni, Ceptura, and Bucov (Battle of the Teleajăn River). The Polish army also entered eastern Wallachia and established Simion Movilă as ruler. Forces loyal to Michael remained only in Oltenia. The rule of Michael the Brave, with its break with Ottoman rule, tense relations with other European powers and the leadership of the three states, was considered in later periods as the precursor of a modern Romania, a thesis which was argued with noted intensity by Nicolae Bălcescu. This theory became a point of reference for nationalists, as well as a catalyst for various Romanian forces to achieve a single Romanian state. To Romanian Romantic nationalists, he was regarded as one of Romania's greatest national heroes. The prince began to be perceived as a unifier towards the middle of the 19th century. Such an interpretation is completely lacking in the historiography of the 17th-century chroniclers, and even in that of the Transylvanian School around 1800. What they emphasized, apart from the exceptional personality of Michael himself, were the idea of Christendom and his close relations with Emperor Rudolf. The conqueror's ambition is likewise frequently cited as a motivation for his action, occupying in the interpretative schema the place that was later to be occupied by the Romanian idea. In the writings of the Moldavian chronicler Miron Costin, Michael the Brave appears in the role of conqueror of Transylvania and Moldavia, "the cause of much spilling of blood among Christians", and not even highly appreciated by his own Wallachians: "The Wallachians became tired of the warful rule of Voivode Mihai". The perspective of the Wallachians themselves is to be found in The History of the Princes of Wallachia, attributed to the chronicler Radu Popescu (1655–1729), which bundles together all Michael's adversaries without distinction. Romanians and foreigners alike: "He subjected the Turks, the Moldavians, and the Hungarians to his rule, as if they were his asses." The picturesque flavor of the expression serves only to confirm the absence of any Romanian idea. Samuil Micu, a member of the Transylvanian School said in his work Short Explanation of the History of the Romanians (written in the 1790s): "In the year 1593, Michael, who is called the Brave, succeeded to the lordship of Wallachia. He was a great warrior, who fought the Turks and defeated the Transylvanians. And he took Transylvania and gave it to Emperor Rudolf". Petre P. Panaitescu states that in Mihai's time, the concept of the Romanian nation and the desire for unification did not yet exist. A. D. Xenopol firmly states the absence of any national element in Michael's politics, holding that Michael's lack of desire to join the principalities' administrations proved his actions were not motivated by any such concept. Mihai Viteazul, a commune in Cluj County, was named after Michael the Brave. Michael is also commemorated by the monks of the Athonite Simonopetra Monastery for his great contributions in the form of land and money to rebuilding the monastery that had been destroyed by a fire. Mihai Viteazul, a film by Sergiu Nicolaescu, a famous Romanian film director, is a representation of the life of the Wallachian ruler and his will to unite the three Romanian principalities (Wallachia, Moldavia, and Transylvania) as one domain. The Order of Michael the Brave, Romania's highest military decoration, was named after Michael. Mihai Viteazul's name and portrait appear on at least two Romanian coins: 5 Lei 1991, which only 3 pieces of this type were minted and the coin was not entered into circulation, and on 100 Lei, which circulated through the 1990s. 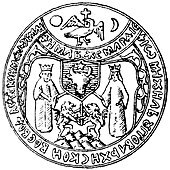 The seal comprises the coats of arms of Moldavia, Wallachia, and Transylvania: in the middle, on a shield the Moldavian urus, above Wallachian eagle between sun and moon holding cross in beak, below Transylvanian coat of arms: two meeting, standing lions supporting a sword, treading on seven mountains. The Moldavian shield is held by two crowned figures. There are two inscriptions on the seal. First, circular, in Slavonic using Romanian Cyrillic alphabet "IO MIHAILI UGROVLAHISCOI VOEVOD ARDEALSCOI MOLD ZEMLI", meaning "Io Michael Wallachian Voivode of Transylvanian and Moldavian Lands". Second, placed along a circular arc separating the Wallachian coat from the rest of the heraldic composition, "I ML BJE MLRDIE", could be translated "Through The Very Grace of God". What's the good word on Michael the Brave?